- Fan speed gauge in Radeon WattMan may sometimes overfill. - Memory clocks on Radeon RX Vega series graphics products may become locked at 800Mhz. - Game profiles with custom fan settings may sometimes remain even after closing a game. - The game streaming tab may be missing in Radeon Settings when Radeon Software Adrenalin 2019 Edition is installed twice on a system. - Radeon ReLive for VR may experience minor corruption for a few seconds immediately after connecting a headset. 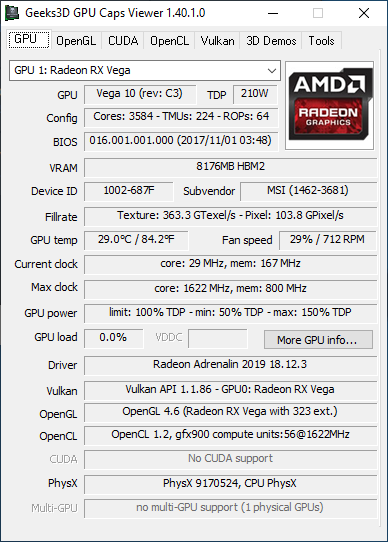 - Auto tuning controls are not displaying their warning message in Radeon Overlay. - Custom values for the sampling interval slider in the performance metrics feature may fail to enable. 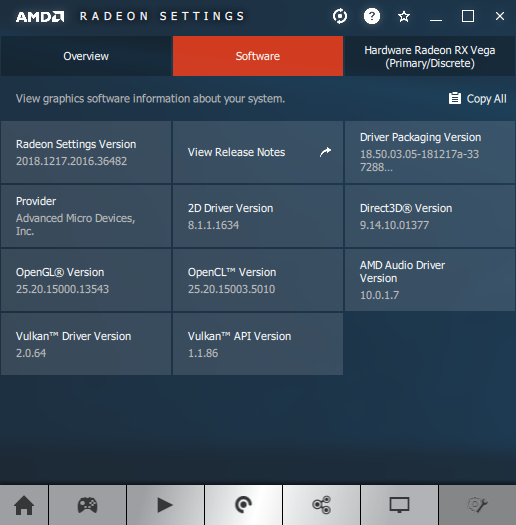 - Radeon Settings may sometimes list a previously installed driver version even after driver successfully upgrading. - Apply and Done buttons may sometimes overlap in Radeon Settings or Radeon Overlay. - Uninstalling Radeon Software may fail to remove Radeon Settings. - Zero RPM may fail to enable/disable correctly when switching between manual and automatic fan controls. - Upgrade Advisor may intermittently fail to detect games and provide compatibility recommendations. - A port 58888 already in use error message may be observed when AMD Link Server was disabled while an IOS device client was - connected. - Radeon Overlay’s new in overlay video player may experience smoothness issues while adjusting the playback slider.